The European Parliament has called for the Gazprom-sponsored South Stream project to be abandoned. But the Russian gas monopoly remains determined to build the pipeline, and has offered that a branch would reach the Baumgarten gas hub near Vienna. According to a Gazprom press release, a memorandum on the implementation of the Austrian section of South Stream was signed in Moscow on Tuesday (29 April). Gazprom chief Alexey Miller and Chairman of Austria’s OMV Executive Board, CEO Gerhard Roiss, reportedly attended the ceremony. The Memorandum sets forth the intentions of the parties to implement the construction of the Austrian section of the South Stream gas pipeline, which will have a capacity of up to 32 billion cubic meters a year (bcm/year) and whose end point will be in Baumgarten (coming from the Bulgarian Black Sea coast, crossing Serbia, Hungary and ending in Austria). The design capacity of South Stream is 63 bcm, according to the project’s website. All permits necessary for construction will be obtained by the end of 2015; the first gas deliveries are expected in 2017. Full commissioning of the Austrian section of the gas pipeline is scheduled by January 2018. If the Austrian section of South Stream is implemented, the pipeline will return to its original design: to kill the Nabucco gas pipeline project, which was intended to bring gas from Azerbaijan to Baumgarten. But Nabucco was abandoned after Azerbaijan opted for the Trans Adriatic Pipeline (TAP) which would bring gas to Italy through Albania and Greece. TAP is planned to begin at the Greek-Turkish border, the previous section being the planned TANAP pipeline across Turkey. The European Parliament recently passed a non-binding resolution denouncing Russia’s handling of energy as a political weapon, which contends that the South Stream pipeline should not be built, and that other sources of supply should be made available [read more]. In spite of the fact that many legal uncertainties over the project remain, Bulgarian energy minister Dragomir Stoynev has recently said that the construction of South Stream will begin in June [read more]. He explained that the legal problems would be solved by the time of its opening. But the Commission retorted that it saw a risk of South Stream being built in breach of EU laws on public procurement. The IGA stipulates that tariffs for using the pipeline would be established “by the Company”, which is in contradiction with the powers of the national regulator to approve transmission tariffs in accordance with EU law. Bulgaria is also trying to exempt the section of the pipeline in its territorial waters and Bulgarian exclusive economic zones from EU law, using language tricks. Thus Gazprom could use the pipes at full capacity, instead of reserving capacity to other operators, as EU law requires. South Stream’s offshore section is planned to comprise four parallel strings laid under the Black Sea within a single routing, at a depth of more than 2,200 meters. Each string will be longer than 930 kilometers. 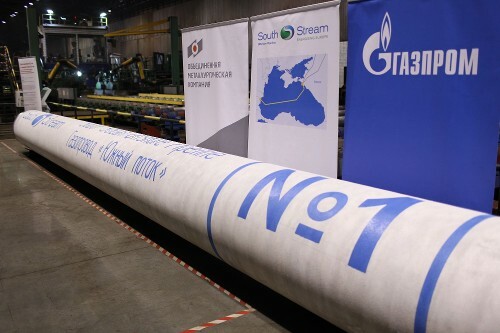 The first pipe for the offshore section was recently produced in Russia. The pipes are unique, as they are 12 meters long, 813 millimeters in diameter, and have a wall thickness of 39 millimeters. These pipes, made of SAWL 450 steel, are designed for a super-high operating pressure of 28.45 MPa. If extra capacity is reserved, more SAWL pipes would be needed, which would affect the cost-effectiveness of the project. But there is an additional reason why Russia doesn’t want to reserve capacity for its South Stream offshore section. Azerbaijan might be interested in using South Stream to deliver gas to Europe, instead of using the Turkish route, experts have said.